Q. I have a recurring meeting whose attendees have changed. I need to remove someone and don’t seem to be able to without deleting the meeting. How would I do this? A. 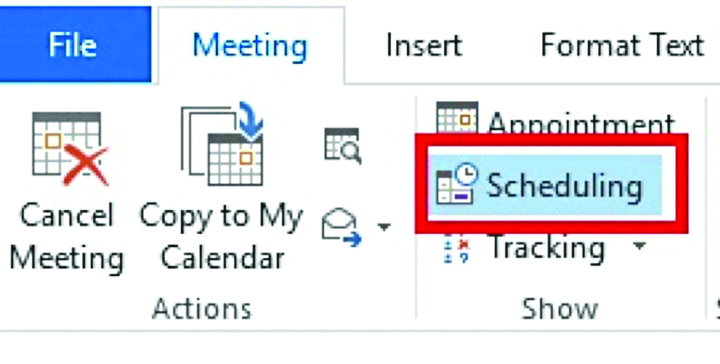 While in the meeting, click on the Scheduling (or Scheduling Assistant) button from the ribbon. Then uncheck the person you’d like to remove. Click to send the updates. You’ll be given the option to send updates to everyone, or just those affected. No one else should receive that information. Q. I have meetings on my calendar that I can’t seem to delete. They are recurring meetings set up by someone else. What can I do? A. These will probably need to be removed by the Exchange administrator for your organization. Try to adopt practices on your team and with others that recurring meetings can only be set up for a limited time, such as 6 months. Another alternative is to create “repeatable” meetings by using Quick Steps. 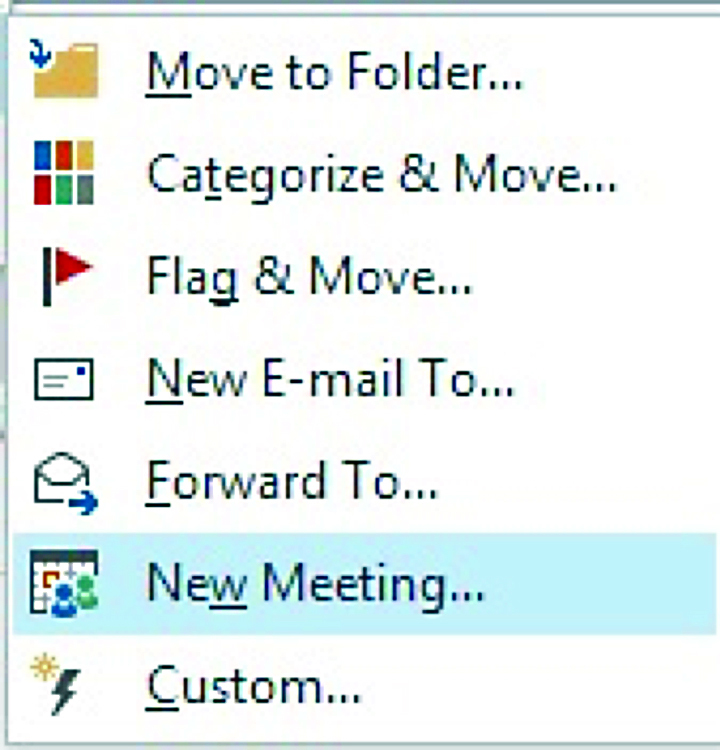 In the Inbox view, click New Quick Step and then New Meeting. Expand the options to fill in the subject, even message text such as an agenda that stays pretty much the same. You’ll be given an opportunity to edit it each time you use the quick step to create it. Q. Recurring meetings seem to have so many problems. Is there an easy substitute for these that doesn’t require a lot of manual labor? A. Actually, there is. Technically, if a meeting is not recurring, it is an individual Outlook item. However, because you can import and export to and from Outlook, you could create the first calendar item for each of the ones that repeat. 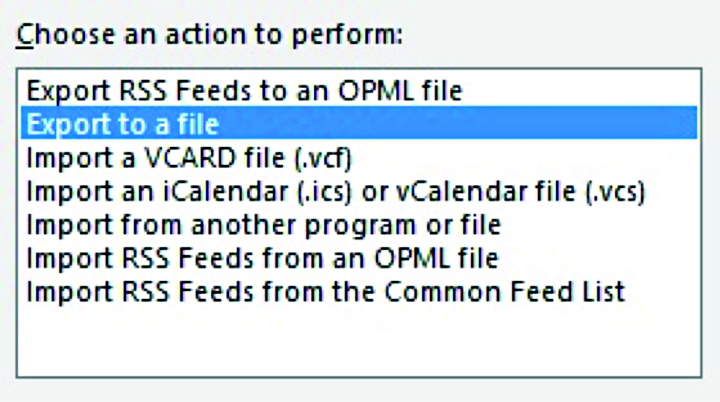 Then, export the calendar items to Excel. This process varies by version. In the later versions, 2013+, it’s File, Open & Export, Import/Export. It will create a CSV (comma-separated values) that you can edit in Excel. Insert blank lines and fill repeating items as many times as you need to. Change the dates, or use autofill, if they occur at repeatable intervals. Now, import it back to Outlook.